Our team takes a bit of time at the beginning of each year to look back and talk about the good, the bad, and possibly the ugly from our projects from over the last year. It gives our team a chance to grow from our experiences, build upon a solid foundation, and move into the new year with new confidence in services we offer our clients. After this past year, we decided to recognize a few of our clients who made our list much in the way that we honored our friends in our high school year book in areas they excelled. 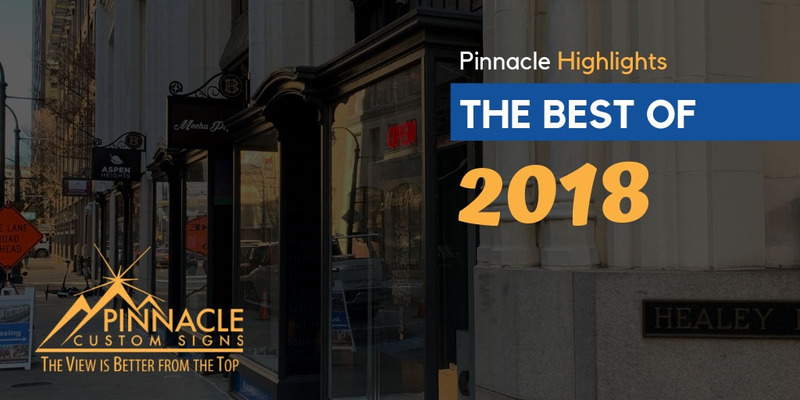 So, we introduce to you the first ever Pinnacle Custom Signs Best of 2018 Superlatives for the Most Creative and Newcomer Clients of the Year Projects. 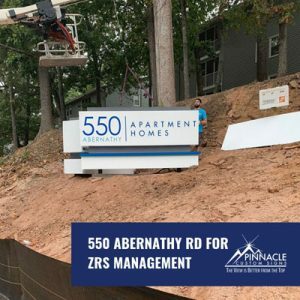 ZRS management has recently been purchasing older apartment complexes in the Greater Atlanta area and refurbishing them. Pinnacle has previously helped them with their Harrison property, The Whitney in Sandy Springs, and with The Landry in Cobb County. The last project on the list was another Sandy Springs project located at 550 Abernathy. Don was very familiar with this location because it was coincidentally the same property where he worked as a groundskeeper back in 1981 while in college. We had a unique challenge at this location because they wanted maximum visibility. We tried to get the city to approve 2 separate signs on either side of the property at both driveways. Unfortunately, due to code you could not have two signs within 650 feet of each other. The property had only 640 feet of frontage to work with. So our team had to go back to the drawing board but we came up with a dynamic solution. One monument sign in the shape of a V that would give maximum visibility to cars passing by. In addition, we positioned it on an existing knoll, adding height to the appearance of the sign without breaking the code of maximum 8 feet tall. The construction of the sign was unique as well. It was an internally lit, push through acrylic custom fabricated sign. It also had multiple colors, so the paint process was that much more complex. After the complete fabrication, the challenge was to install it on the hill. We had to acquire special equipment to move the sign into place. On this project for Venterra Realty, we had the opportunity to print and install a total of 9 separate acrylic panels that used 54 stand-off mounts to be installed on the hallway wall. We printed the panels individually and then lined up the design and installed it on standoffs that allow it to look more like artwork and not directly printed on the wall. 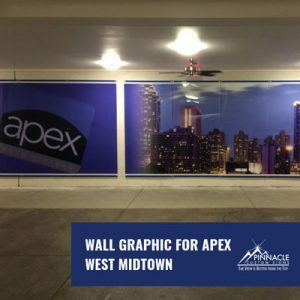 The overall effect was close to museum quality art which provides another aesthetic tool for the property management team to attract future residents to this Apex West Midtown property. Check out the finish product. Our work for NeoGenomics gave us the opportunity to highlight the specialist in cancer diagnostics and pharma services offering innovative diagnostic, prognostic and predictive testing. 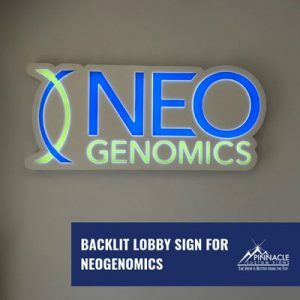 We literally got to light up their lobby with a new push through acrylic lobby sign for their offices. The use of the bright color palette and curves in the company logo really made this particular project pop. Utilizing the push through process was a creative us to enhance the well design logo. The Workout Anytime Franchise is always one of our favorite clients to work with on locations across the country. However, this past year we got to help them apply that 24/7 mentality to the company RV. 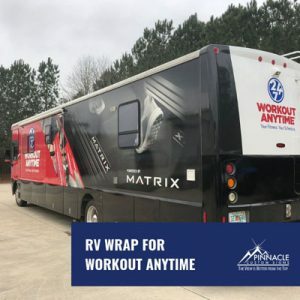 Workout Anytime utilize the large amount of space on the RV to create distinct designs for each side and the back of the RV to maximize their mobile marketing on the road. Our design team had a lot of fun in the creativity of the graphics as well as ensuring that the pattern worked well with the details of the RV to create a custom brand for this billboard on wheels. Equitable Management reached out to Pinnacle Custom Signs this past year to provide new signage for a building that’s been around for more than hundred years. They needed 22 ornamental hanging signs to highlight the building tenants. Since this building was registered on the National Historic Registry, a lot of special accommodations and conditions surrounded the production and installation of new signs. 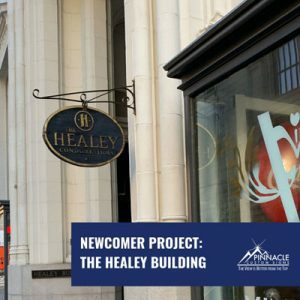 Not only was this a challenging project, but a great start for Pinnacle to work with the Healey Building in the future. Pinnacle’s knowledge and expertise in the permitting process became our greatest asset in getting this job done. See the finished work for the ornamental signs now. Our new relationship with Georgia 811 gave us the opportunity to create fleet graphics that had various concepts. 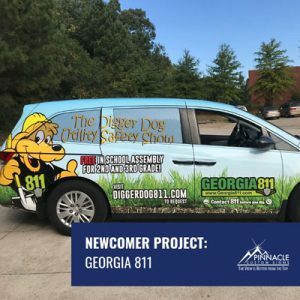 Georgia 811 knew that they needed to maximize their vehicle graphic space to showcase different things depending on the use of the van. From highlighting the education efforts of the organization to promoting the website and phone number that need to be used for appropriate digging processes, their van wraps conveyed the appropriate message. We not only loved the opportunity to provide the graphics for this client- we loved the client! We hope to be able to work with the team at Georgia 811 again soon. Congratulations to this year’s clients. We know that this is an honor you never knew you needed or maybe even wanted to be recognized for before now. However, we look forward to displaying your creativity and working with you as clients for many years to come. For an opportunity to be recognized as the best of 2019, start today by calling us to discuss your upcoming signage needs.